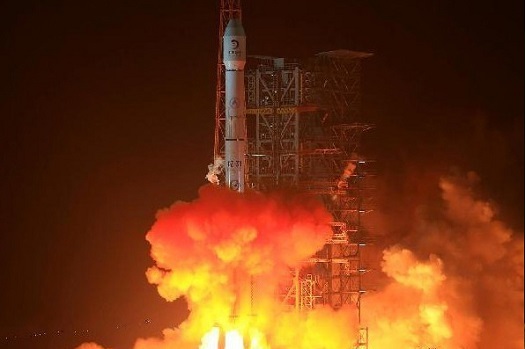 China is in the midst of an overhaul of its satellite launch capabilities, with the introduction of five new launch vehicles in just over two years. China will debut a new medium launch vehicle, the Long March 7, in June. Three months later, it will launch its largest rocket to date, the Long March 5, which will be capable of placing 25 metric tons into low Earth orbit. Last September, the Long March 6 and Long March 11 debuted to serve the small satellite launch market. A third small launcher, Naga-L, is set to make its inaugurate flight by the end of 2017. Long March 7 is based on the successful Long March 2F booster, which is used to launch Shenzhou crewed spacecraft. It is considered a cleaner booster because it uses liquid oxygen and kerosene instead of the hazardous dinitrogen tetroxide (nitrogen tetroxide) and unsymmetrical dimethylhydrazine used in the existing line of Long March boosters. The new booster shares engines with the Long March 5 and Long March 6 boosters. Long March 7 will replace the Long March 2 rocket family and eventually the Long March 3 boosters. Long March 5 will give China a launch vehicle similar to the American Delta IV Heavy. It will be used to launch modules for China’s permanent space station, which is set to begin construction around 2018. Next year, Long March 5 is scheduled to launch the Chang’e 5 mission, which is designed to return soil samples from the surface of the moon. The Naga-L, which is set to be the first Chinese launch vehicle to operate outside of China, is focused on serving the commercial small satellite market. Officials at the China Academy of Launch Vehicle Technology (CALT) are examining launch sites in Indonesia, Tanzania, Sweden and China. The table below shows present and future Chinese launch vehicles. In the slightly longer term, SAST are working on CZ-6A with solid boosters and a larger upper stage, which should put a few tons into SSO, and there’s CZ-8 and Kuaizhou-21 in early dev which are both aimed at SSO and which we don’t know much about. Could anyone shed some light at the extraordinarily claim of CZ-7 “based on” CZ-2F? It seems preposterous on the face of it, since CZ-7 has more in common with CZ-6 and CZ-5 than anything, but perhaps I’m missing something. For example, is CZ-7 borrowing structures or avionics from CZ-2F while using engines of CZ-6? The first launch of CZ-7 went up from Hainan (using the “zig-zag” crawlpath and “mini” VAB AFAIK). It’s structurally based on it, it uses the same diameter for the core and boosters. The next-gen booster family started as a project to convert CZ-2F to kerolox, called CZ-2F/H, but became more ambitious. The Chinese never seriously considered using normal CZ-5 for crewed lunar landings, though the report Griffin mentioned was translated into Chinese and is sometimes presented as a Chinese study. They did do EOR studies with a heavily beefed-up ~50 ton variant called CZ-5DY (IIRC), but decided on Saturn-class super-heavy LV. Yes, the LM 9, are they actually funding that at all? Does their new launch facility have a pad for something that large yet? Trying to work out exactly what’s been authorised and by who can be quite tricky, but as far as I know CZ-9 has been given the go-ahead in the past few months. I know for sure that development of the engines has started, and they’ve done test forgings of ~9m diameter structural rings. Flight is 10-15 years off, so nothing at Wenchang yet. Is the Kuaizhou-11 larger than the Kuaizhou-1 and -2 boosters that were launched a few years ago? Are those earlier boosters still in use? Is the info I have for them at the top of the second table accurate? The earlier booster is Kuaizhou-1, Kuaizhou-1 and -2 were the missions it launched. Kuaizhou-1 uses custom payloads that’re integrated with the liquid upper stage, so not much need to differentiate them from the launcher. Payload has been given as 430kg at SSO, but that probably includes the upper stage and would be less for a normal payload. Kuaizhou-11 is much larger than Kuaizhou-1. As for if Kuaizhou-1 is still in use, I don’t know. It was supposed to be available for launch on short notice after natural disasters, but I don’t know if the government actually gave this concept authorisation. We’ll probably find out next time there’s an earthquake in China.